Submersible Systems is now offering units pre-filled to 3000 psi for a $15.00 fee. Your new unit is shipped by FedEx Ground and is ready to save your life right out of the box. The following products now offer the pre-filled option. FREE January 10, the Biggest Day Ever Surfed DVD. 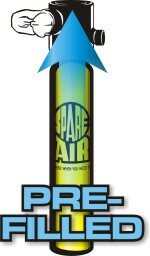 Free with the purchase of any Spare Air Xtreme package. Not available for sale. A $24.95 value. Offer good while supplies last. The DVD will automatically be added to your shopping cart when you order one of the eligible products. FREE SHIPPING is offered on all domestic shopping cart orders of $200.00 or more. Good for a limited time. Valid for shipping to addresses in the Continental United States only. Discount applies to FedEx ground only and will be applied in the shopping cart. Eligible Products: All and any combination that adds up to $200.00 or more before tax and shipping. NOTE: This offer applies to shipping only. All Spare Air, Spare Air Xtreme, HEED 3 and Spare Air Industrial Units are charged a $2.00/unit handling fee that appears as a shipping charge on your invoice. No charge for FedEx Shipping costs are applied.